So one of the first things I noticed upon settling in here was that I had a cable television in my room with a rather intimidating amount of local channels on it. Although this didn’t come as a surprise, I must admit I did stick to my tried-and-trusted BBC/CNN/Discovery channel combo that seems to be the ubiquitous trio for English language cable programming in foreign countries. Only after a couple of weeks here did I venture into the exciting world of Korean television. 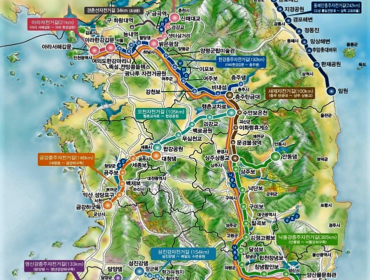 Having heard about the “Korean Wave”—the recent surge of popular film, television and music spreading across Asia—I was eager to see what it was all about. Now, after four months in this wonderful country, I can safely say that I haven’t the foggiest of ideas about Korean popular culture. For example, I don’t understand why throwing five random celebrities into a concrete room and having them play what appears to be Christian party-style board games has any entertainment value to anyone (save the actual Christian board game party enthusiasts). But I digress; what I came here to say is that what I did notice during my digestion of Korean television was the large amount of celebrity endorsements in the commercials here. That is not to say that this is a completely foreign concept; after all, there is the occasional celeb-endorsement on Western television too. It was the sheer volume of this style of advertisement that interested me; and furthermore, the fact that it seems like if you are a particularly popular actor/actress/boy band/girl band/gender nonspecific DJ, you can make a pretty lucrative paycheck endorsing any number of products. I have yet to see the boys from 2PM endorse both Coca Cola and Pepsi, but I wouldn’t be surprised if that happened at some point. I am still on the fence as to what I think of this method of advertising. Apparently the execs all seem pretty happy with it—a recent research paper suggests that almost half of all Korean television commercials rely on celebrity endorsements. I am beginning to sense a sort of chicken-and-egg conundrum in all of this. For example: are the multitudinous boy and girl bands created by the big firms to peddle merchandise, thus making them famous along the way? Or is it the other way around? Do the big corps flock to the groups that are currently on top right now to attach their star powered glimmer to their products? I seriously wonder when I see an entire song dedicated to a cell phone on the channel, “Mnet.” Who is pulling the strings here? I mean, look at American Idol—that monstrosity makes far more money from advertising space during the television show than any of the actual winners can generate in royalties from their (oh-so- memorable) albums. The only reason they even have to promise a record deal to the winner is so that the whole grotesque process is somehow legitimized by seeing the winner on an album cover at least once. In Korea more than anywhere I have visited, I feel like corporate and celebrity culture have merged into something very, very, well….effective actually. Having said that, I suppose I do take issue with what I am seeing. My problem with the whole thing is where to draw the line. I mean, if there are some stunningly beautiful, mature Korean actresses (there are) who have mind-bogglingly good skin for their age, well then fine, endorse all the skin cream you want. If you are some vivacious, nubile, young gentleman who enjoys the more refined gustatory delights in life, go for it, star in a Coca Cola ad. But if you are an American Television personality, famous for your whimsical and heartwarming painting edutainment shows and you have also been dead for 15 years, perhaps you should rethink the move into peddling touch screen phones. As is often the case with discussion of appropriateness, the trusty metaphor of “The Line” comes to mind. I think there is a “line” that shouldn’t be crossed when it comes to advertising. I also think this line has been unceremoniously crossed with Korea Telecom’s Bob Ross commercial. 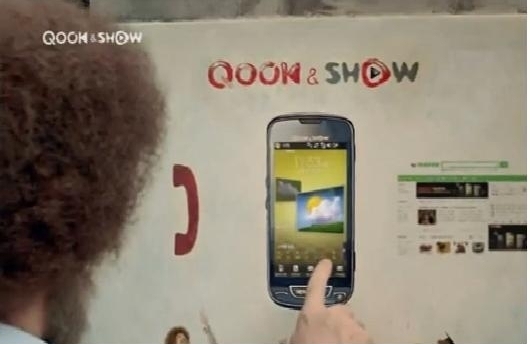 For those of you unfamiliar (and too lazy to watch the link I just so graciously provided to you) the ad in question features a digitally superimposed Bob Ross operating a touch screen phone whilst espousing (my guess at least) all the amazing features of the latest phone that Korea Telecom has vomitted out of it’s ever churning gadget factory. What’s more, Bob Ross apparently knows how to speak Korean. 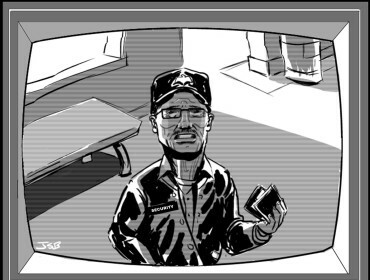 To throw salt into the already gaping wound of our collective dignity, for the scenes requiring slightly more activity from our old friend Bob, a body double is used; and by “body double” I mean white guy with a beard. I don’t really know whether to feel sorry for the actor who did the work in that ad, or whether to dedicate the rest of my life to making him feel miserable. Seriously, when that casting call comes across your desk, do you really think it will enhance your acting career in any meaningful way? I suppose if you intend to become one of the Carrot Tops or Screeches of popular culture, you could go this route…..but really, I cannot think of anything more pathetic than having “Bob Ross impersonator – Asian region” written on my resume. Watching that commercial left me with a great deal of questions. 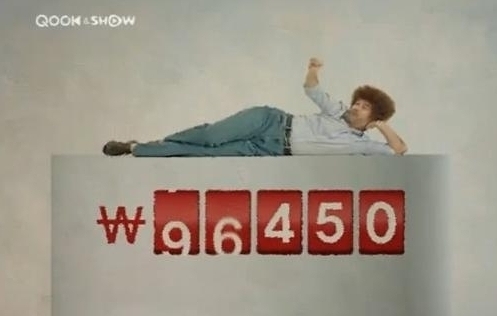 I wondered whether the Bob Ross Estate knows about this commercial, and if they did consent to it, for what reasons. I would like to think that the family were told that it would be a respectful and affectionate attempt to give the world a few more minutes of Bob Ross from beyond the grave. Forgive me if my pessimistic side shows when I say that I really think that the main driving force behind such an endorsement is money. And what’s next? Golden Palace holding a live exhumation of Bob Ross TM to have his chest tattooed with their ubiquitous URL address? Perhaps I’m not being culturally sensitive enough here, I need to say this: Korea Telecom, please feel free to hire whomever you please to peddle your inexhaustible stable of cell phones. Hell, get Celine Dion if you really want to, but please don’t reanimate the dead ever again. Please. Except maybe Michael Jackson. That would be awesome!